Ann Blockley RI SWA is a renowned watercolour and mixed-media artist with an individual style developed over a lifetime of professional painting. Her pictures are evocative, atmospheric and intuitive. Her longstanding passion has been for nature, inspired by the countryside and gardens close to her Cotswold studio. 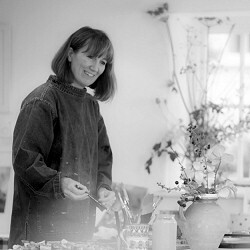 Ann has a worldwide reputation for her unique interpretations and has written many books on her painting methods and filmed several dvds covering a wide variety of subjects. In later years she has moved from flowers and animals to the landscape with its trees, hedgerows, birds, and wild-flower meadows. In all her pictures, Ann uses painterly textures, marks and edge values, using watercolour in an expressive, magical style. She stretches the boundaries of the medium, sometimes working on different surfaces to create unconventional textured images and sometimes reconstructing her work into intricate collages. She is continually exploring, experimenting and re-evaluating her work. Ann’s work is exhibited in galleries throughout UK and beyond and she also arranges her own solo shows. She writes for the Artist magazine and other international magazines. She is a member of both the Royal Institute of Painters in Watercolour (RI) the Society of Women artists (SWA), who both hold their annual exhibitions at The Mall Galleries in London. She is also a member of The Arborealists, a diverse group of artists who value trees, forests and a connection with nature, exhibiting in venues and galleries around UK and France. Ann’s late father was the inspirational artist, John Blockley RI PPPS RWA. Years later I visit a different wood on daily walks. I watch a new generation of rooks gather and swoop and listen to their cacophony of sound as the sun lowers itself into the tangled black lace of the treetops. I am no longer a princess but I imagine myself to be an artist and I collect leaves and acorns, thoughts and words and feel my way into the moods and seasons of nature. I imagine I am a creature scrambling through earthy tunnels under the brambled hedgerow, weaving my way around gnarled roots and burrows. I imagine I am a bird, perching in that hedge with its skeins and creeping ribbons of berries. I watch the light pierce through gaps in the labyrinth of marks and shimmer in the ponds where I see the entangled trees and undergrowth reflected. I take these thoughts back to my studio which is built from ancient beams of oak and elm. Here I can remain connected with the poetic, precious organic world of the woodland, hedge and field. I let the paint flow and mingle, using marks in ways that evoke and suggest something of nature’s words and imagery. The challenge is to convey a mood and create an air of mystery or magic. The aim is to subtly alter reality into something more elusive. I enjoy playing with marks that are intriguing in themselves and sometimes merely allude to the facts. However, I am influenced by the way that the wanderings and happenings of paint often echo nature itself.